It's A 10 Miracle Hair Mask Dupe? First, I should start by saying that I love the quality of both of these products. I started my hair journey with It's a 10 products and I still buy it from time to time. However, It's a 10 product prices are steep. I have found similar products for a fraction of the cost without sacrificing quality. Without a doubt, Miracle 7 is giving It's a 10 great competition. I haven't tried all of their product but I am definitely a fan of their moisture line (in the blue bottles). 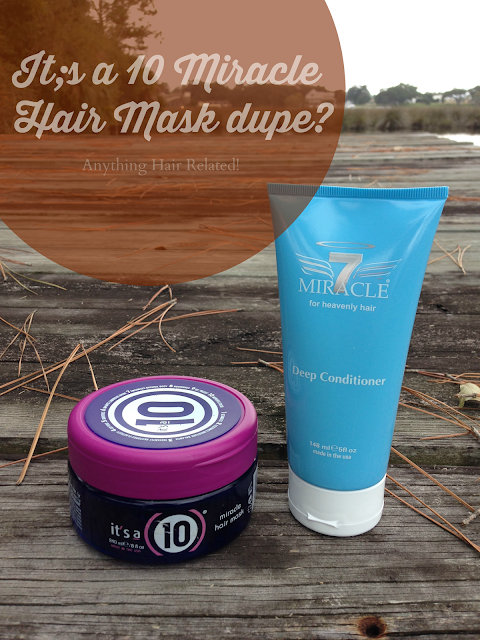 I want to compare Miracle 7 deep conditioner to It's a 10 miracle hair mask. 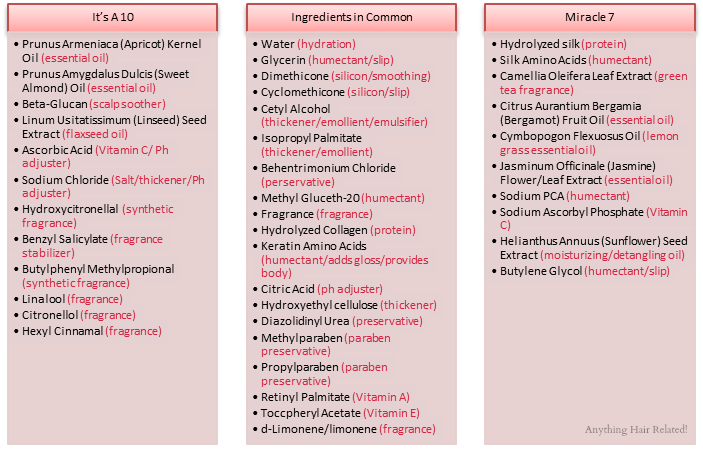 I will give a brief breakdown of each product, like I did in my last post, and let you be the judge. Last year, I shared a post about a dupe for It's A 10 Leave In conditioner. View it HERE. I love the It's a 10 packaging. Because it's in a jar, it's easy to get out all of the product. However, the Miracle 7 squeeze tub isn't a deal breaker for me. I simply cut open the bottle to scoop the remaining product out. As far as price, Miracle 7 is definitely more cost efficient. At Sally's, Miracle 7 is on sale frequently. Occasionally, Sally's has a BOGO sale (buy 1 get 1 free) on all Miracle 7 products. It's A 10 Miracle Hair Mask..................................Drugstores, Department Stores, Salons, Online. Miracle 7 Deep Conditioner.................................Sally's Beauty Supply, Online. There aren't many places where Miracle 7 products are sold but they can be purchased at Sally's Beauty Supply and online. However, It's a 10 products are sold at many drugstores, department stores, salons, and online. In the clipboard photo above, I listed all of the ingredients for both products in different columns. The pink compare/contrast photo lists all of the ingredients that both of the products have in common; as well as the ingredients that they do not have in common. In my opinion, Miracle 7 deep conditioner can claim to have 10 benefits for hair just like the It's a 10 miracle hair mask. Both of these products share common ingredients that promote the same 10 benefits as It's a 10. As for their differences, It's a 10 is packed full of unnecessary fragrance. However, Miracle 7 is loaded with humectants, which could benefit the hair by preserving moisture. 3 comments on "It's A 10 Miracle Hair Mask Dupe?" Hi. Thanks for the comparison. 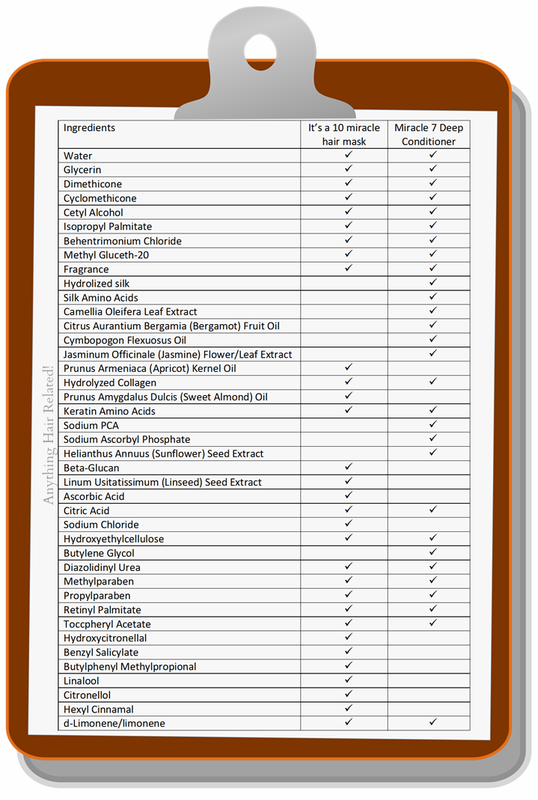 FYI: Apricot kernel and Sweet almond oils are *not* essential oils. They're moisturizers, like linseed, jojoba, etc., and they have no fragrance. Also, the definition of essential oil is any naturally derived oil. I researched this topic before I posted the information.